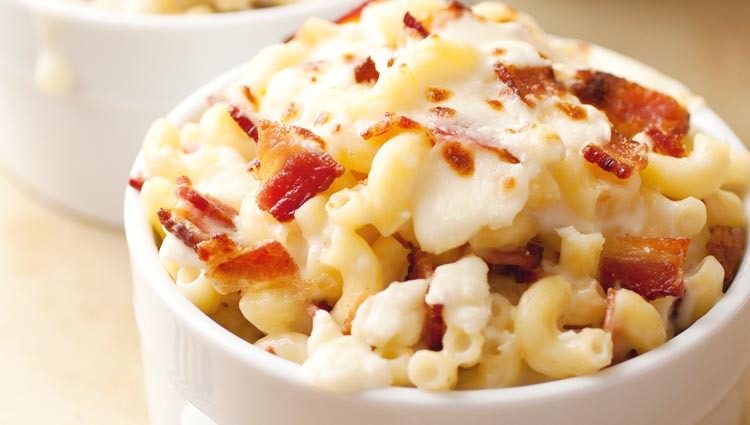 Smoky bacon combines with the bright flavors of provolone and Odyssey feta for a unique twist on mac and cheese. Cook macaroni according to package directions; drain. Meanwhile, cook bacon in a large skillet until crisp. Remove bacon to a paper towel to drain. When cool enough to handle, dice bacon. Melt butter in Dutch oven over medium-low heat. Whisk in flour until smooth. Gradually whisk in milk. Bring to boil; cook and whisk for 2 minutes or until thickened. Reduce heat to low; gradually stir in provolone and 2/3 cup feta until provolone is melted (feta crumbles will be visible). Stir in macaroni and three-quarters of the bacon. Season with salt and pepper to taste. Remove from the heat. Spoon macaroni mixture into a greased 11 x 7-inch baking dish. Sprinkle with remaining bacon and feta. Broil on high until the feta is golden brown (watch closely), about 1-3 minutes.